The phone rang interrupting the morning quiet in our family’s suburban Chicago home; it was my mom on the line. Would my brother and I drive over the van to retrieve an old dresser that she had seen at a garage sale? Sure, I said. She was at work; my brother Mark and I were hanging out at the house not due at our own jobs for another few hours. We got in the ’76 Chevy Beauville – its life extended by many summers hours sanding the rust off the lower sides before coating them with Rustoleum – and made the ten minute jaunt to the part of town where some old gem piece of furniture had caught my mom’s eye. When Mark and I saw the dresser, we busted out laughing. We didn’t see any beauty – the dresser was old, darkened, ugly, shoddy, and neglected. The top of the dresser was a pock-marked and gouged mess. My mom had paid all of $5 for it. Ha! 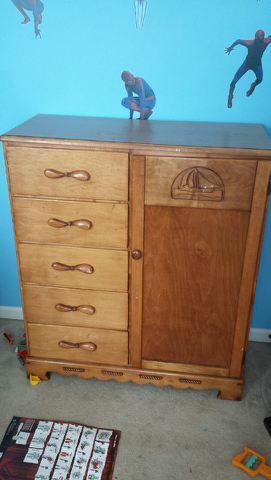 We didn’t know what was funnier: the dilapidated dresser itself or that she had paid only $5. We laughed the whole way home as the Beauville trudged back through town with its disputed treasure. Mark and I were on summer break from college when we heeded our mom’s request. Soon enough, however, we were back at school and away from home. Unbeknownst to us, our mom was slowly and patiently working on that dresser. The fall becoming winter is a great time in the Upper Midwest to work away on a time-consuming project in the garage or basement. Mom painstakingly stripped off the old varnish (the dresser boasted ample intricate wood cuttings and carvings which I had not noticed), sanded and stripped some more, had our dad cover the top with durable edge-routered formica, and applied multiple coats of polyurethane to all of the outer wood. When I came home for Thanksgiving, I happened upon a new dresser in the basement. It was beautiful. A mariner theme with wood carvings of rope, rudders, and a sailboat stood out from this carefully constructed piece of furniture. When I saw my mom a bit later, I asked her where she got the new dresser. Now it was her turn to laugh at me. It was the old $5 gem, newly reconstructed by my mom. I was stunned. Mom’s dresser – impervious to the machinations of Spider Man . . .
Years later when my wife and I moved to Houston, my mom was kind enough to let us borrow the mariner dresser for our daughter Alex. We had the dresser for six years or so while we were in Houston. The dresser is now back in the Chicago area at my sister’s house and in the room of my nephew Miles. There’s something about how my mom worked on that dresser that relates to the process of writing a book. It took me the better part of three years to write Just a Little Bit More. Six months intensive reading and research, twelve months of writing with continued research, an additional twelve months of rewriting and reviewing edits, and six months of design detail and preparation for selling. I worked on the book while pursuing my regular full-time job which, logically, elongated the process. I never cherished the dream of “one day to write a book.” I’ve always read a lot, but ask my family members or friends: not one of them foresaw me writing a book. While writing a book is more involved than rehabbing a piece of furniture, the same principles apply. Occasionally I look back with a touch of astonishment on the work and effort required of me to write Just a Little Bit More. Braggadocio aside – the combination of perseverance and passion can produce improbable results. As I remember my mom’s dresser, I can see where I got some of that perseverance . . . from her. In addition to rehabbing furniture, my mom specializes in two other creative tasks requiring patience and steadfastness: sewing and quilting. She has made numerous blankets, bedcovers, quilts, and clothing items that have blessed the lives of her six adult children and their spouses, her sixteen grandchildren, and many others (yes) throughout the world. It’s cliché to exalt the philosophy of one step at a time and one day at a time. Another way to express the wisdom inherent to those clichés: sometimes slow is fast. In an instant gratification society, putting work into a long term project (like a refinished dresser or a book) seems anachronistic. Isn’t there a shortcut or an easier way? Not always – sometimes slow is fast, and the resultant quality reveals, for those who look carefully, an enduring legacy of commitment and passion.